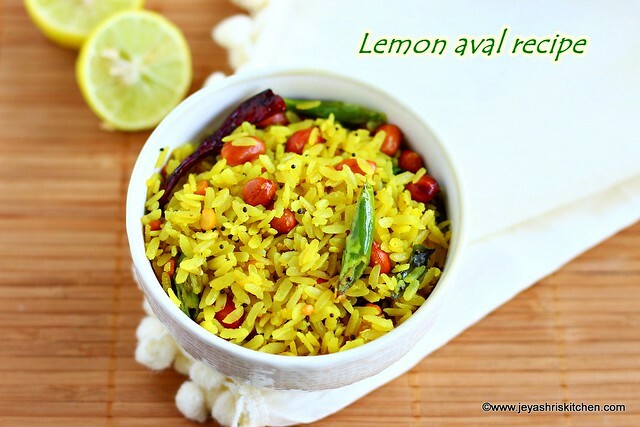 Lemon aval recipe| lemon poha is a quick and easy, bachelor friendly breakfast recipe made using poha| aval, with a tangy flavour of lemon. Most of the days when we are running out of time or out of idli dosa batter, you can make this lemon aval recipe. Even this recipe comes as a savior for weeknight dinner too. 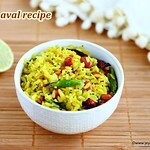 I used getti aval | thick poha for this recipe. You can sue red aval too. Thin aval | lacy poha will not work well for this recipe as the poha will not get separated easily when using the thin ones. Poha| aval| rice flakes are commonly used to make upma and we use it in making idli dosa batter as it gives softness. Also aval is widely used in making payasam, kesari and puttu. I have posted the popular batata poha recipe in jeyashri's kitchen. In the mango season do try the Mango masala poha recipe. Also we have the South Indian version of Milagu aval, puli aval, mor aval and vella aval recipe. Do try this variety of poha recipes from Jeyashri's kitchen and enjoy your breakfast. 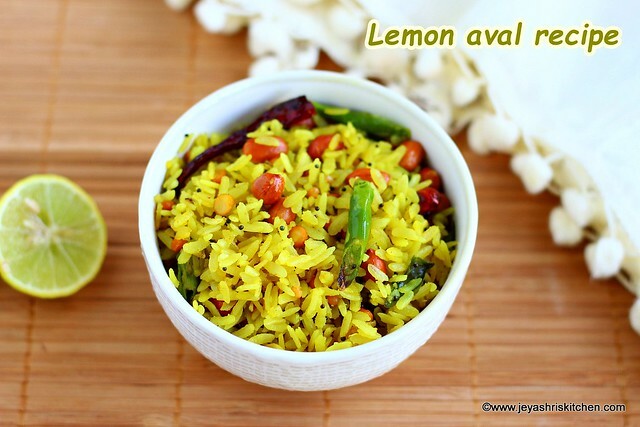 Description: Lemon aval recipe| lemon poha is a quick and easy, bachelor friendly breakfast recipe made using poha| aval, with a tangy flavour of lemon. In a wide bowl add the poha | aval and wash it twice and add turmeric powder, salt and mix well. Add the lemon juice to this and mix well. It will not taste bitter when you cook, so do not worry. In a pan add oil and add the mustard seeds, chana dal, urad dal, peanuts, red chili(broken), slit green chili, curry leaves and ginger to this. Saute till the dals turn golden brown colour. Ensure not to make it burnt. Now add the aval mixture to this. Switch off the flame in a minute. If needed garnish with chopped coriander leaves. Lemon aval is ready to serve. A simple coconut chutney is a perfect accompaniment for this lemon aval. We can add grated carrots to this lemon aval recipe at the end to make it more healthy.